Two guinea pigs spend a fun-filled day together, painting, reading, baking, and sharing a picnic. Through it all, they find lots of different ways to show the very special love between them. 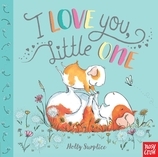 This sweetly illustrated story from Holly Surplice is perfect for mothers to share with their little ones at bedtime—or anytime! Holly Surplice was born and brought up near Dumfries, Scotland, where living on a farm nurtured a fascination and love of animals that continues to feed her work as an artist and illustrator today. She is also the author-illustrator of Guinea Pig Party and Hush-A-Bye Bunny. After traveling as far as the Galapagos, she now lives and works in Edinburgh, Scotland, with her husband, their young daughter, and a dalmatian named Marbles.